What's this cats name? You all know who this is. You can't deny this album. 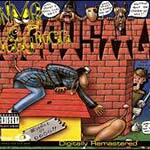 This is the album that blew the West Coast up!!! If you didn't get it about 9 years ago, it's never too late. 8. Who Am I (What's My Name)?